Our 14 acre farm serves the Atlanta area, just 35 minutes east of the I-285 Loop on Interstate 20 at the NE corner of exit 105. You won't have to spend half of your time just getting here! 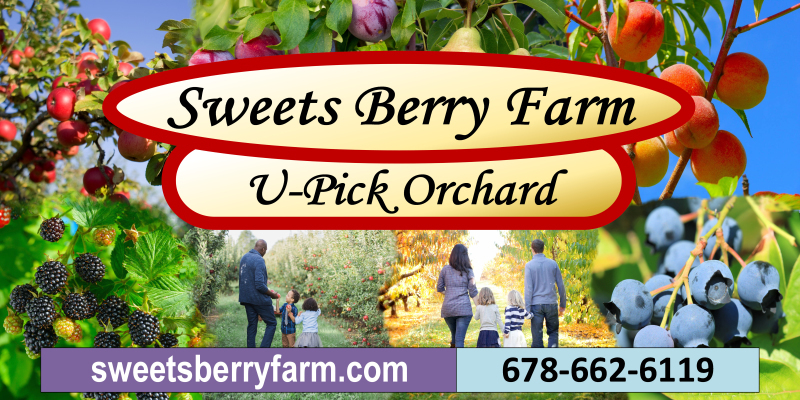 We make it easy to hop off the freeway and pick the freshest, sun-ripened fruits and berries! If you enjoy the fun of picking your own fruits and berries with friends and family, showing your children where real food comes from and to appreciate the taste of fresh-picked fruits, then pay us a visit. The difference between fresh and "ripened during transport" will keep you coming back. Giant Thornless Blackberries will come in around the beginning of June. Call to check on berry readiness! 10% of receipts are donated to Christian Outreach Ministries around the world through First Baptist Church of Woodstock. Click on "Hours and Location" for a map to the farm.